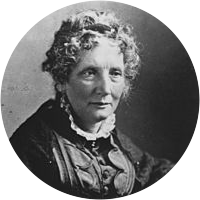 A collection of the best Harriet Beecher Stoew quotations. Prayer is a long rope with a strong hold. Praise is sunshine; it warms, it inspires, it promotes growth. Homely services rendered for love's sake have in them a poetry that is immortal. Every human being has some handle by which he may be lifted, some groove in which he was meant to run; and the great work of life, as far as our relations with each other are concerned, is to lift each one by his own proper handle, and run each one in his own proper groove.